Salt Lake Temple Oil Painting by Art-LDS.com. Art-LDS.com is a website that sells original, handmade oil paintings of every LDS temple in the United States. That, in itself, is not all that unique, as there are many websites out there that do the same. But what does make Art-LDS.com stand out is their uniquely low prices. 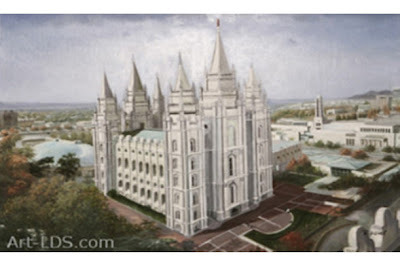 For approximately $150 (free shipping included) you will receive a 20 x 24-inch painting of your favorite LDS temple. This is about half the price of similar paintings found on other websites. While I can’t speak to the quality and beauty of each individual painting from Art-LDS.com, I can readily recommend the painting of the Salt Lake Temple, which is the one I have in my home. The artist of this temple has taken the time to account for every beautiful detail that makes up the unique, hand-crafted look originally given to the Salt Lake Temple by the early pioneers. To me, the colors depicted in the temple’s setting represent early fall—colors that would complement almost any home décor. I would highly recommend spending the extra money to upgrade the painting's size, which would give you an impressive 36 x 24-inch version like mine. I am very pleased with the overall feel and look of my Salt Lake Temple painting from Art-LDS.com, and I know it will be a beautiful focal point in my home for years to come.